Those were the only words that Mr. Musa Andrew could mutter while standing perplexed with his two hands folded across his shoulders and resting on the wall of Saint Daniels Hospital, Otukpo. Mr. Andrew, a Corporal with the Nigerian Police Force, Otukpo division could not believe what he saw when he was called upon by the hospital authority on Thursday, 1st August to make himself available at the maternity ward, where his wife, Mrs Ene Musa Andrew had just given birth to a co-joined twin through cesarean operation. Daybreak Newspaper gathered that the parents of the Siamese twin were astonished at the birth of what they described as a “strange being”. According to them, there had never been any trace of abnormality in their lineage and would always wonder where that had come from. 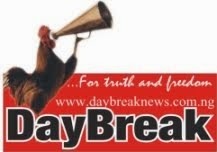 Speaking with our Correspondent in his office, the Proprietor of Saint Daniels Hospital Otukpo, Dr. M.O. Daniel disclosed that the Siamese twin have four hands, three legs, two heads, two chests, two noses and posses the same pelvic girdle but joined together at the abdominal region with a shared female organ with one having a healthy nutrient of surviving than the other. Dr. Daniel further disclosed that the twins were eating well but it would be semblance situation if the parents were not kin at their treatment because it would require high-tech surgical operation outside Benue State. The parents were also told that a lot of medical skills, energies and prayers were the only way out. “I have been encouraging and counseling the parents not to be discouraged or feel bad because these are living beings created and designed by Almighty God", he added. Dr. Daniel therefore called upon the government, philanthropists, well wishers, non-governmental organizations, motherless baby homes, Pastors, Imams and all well-meaning Nigerians to help the parents with the needed fund for advance operation at UNTH Enugu, National Hospital Abuja, Indian or South-African Hospitals, where an urgent and successful surgery could be carried out on the Siamese twin. The parents of the co-joined twin who live at No. 4, Jerusalem Street, Otukpo, Benue State also cried out to Nigerians to come to their aid and save the twin. According to them, they have two other kids whom they take care of with their meager salaries as civil servants and could not afford to foot the surgery of the Siamese twin which requires a huge amount. The parents appealed to Nigerians who feel obliged to help with any amount to do so through the First Bank Otukpo account number 3052747840, with Musa Andrew as the account name. Mr. Andrew could also be reached on his cell phone number 07035173932 while Dr. Daniel also provided his mobile number 08051855649 for further enquiry. Meanwhile, the Executive Chairman of Otukpo Local Government Council, Dr. Innocent Onuh paid a visit to the hospital in the early hours of today (Monday) where he met with the parents of the twin. 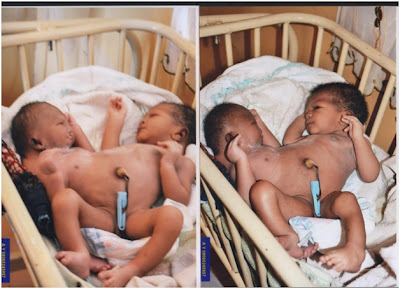 While identifying with the parents, Dr. Onuh urged them not to see the Siamese twin as monsters or bad omen to the family but rather as human beings from the almighty. The council chairman who made a donation of one hundred thousand naira (N100, 000) to the parents also called on good-spirited Nigerians to, as a matter of urgency, make good donations to enable the twin undergo proper operation for their survival.